-MORE: your chance to maybe get a Sloth Selfie! (© 2018 S&t Inc ) and meet these other critters too: Harris Hawk, Eagle Owl, Vulture, Alligator, Snakes, Tarantulas, Tortoises, Bunnies, Ferrets, Goats, Donkeys, and Emus! I am working on challenging the Sloth to a foot race around the building. Place your bets!. More info as it becomes available... 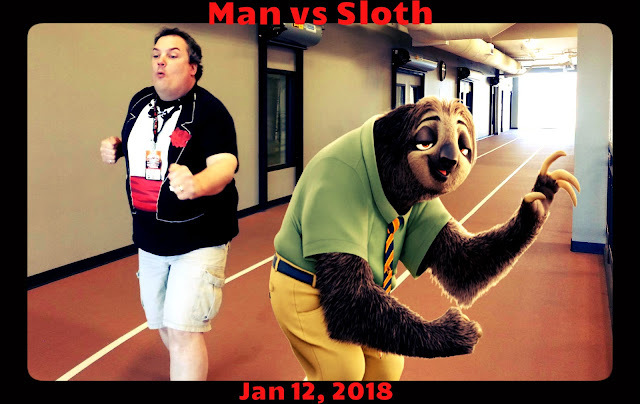 The Scott vs Sloth race was called off this morning when I realized that Linus the Sloth is only 8 months old. Next year, Linus. Next Year!